Business Insider is writing that Walmart is adding Cleveron's PackRobot to more than 500 stores. "Think of this as an ATM for parcel pickup," JP Suarez, Walmart's vice president of real estate, said at a recent conference, according to Bisnow Houston. "We’re putting 500 of these towers in our stores, we love them." 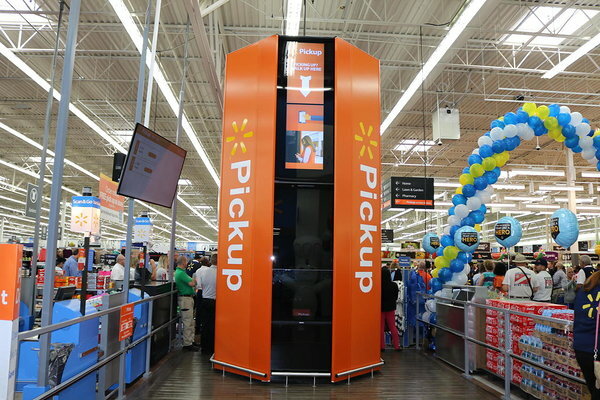 The massive towers, which stand at least 16 feet tall and 8 feet wide, rapidly retrieve online orders for customers who shipped their purchases to a Walmart store. Walmart said in July that it planned to roll out the towers to 100 stores. Now, it's raising that number to 500, Bisnow Houston reports.